Hansen Publishing Group, LLC, 9781601820587, 112pp. 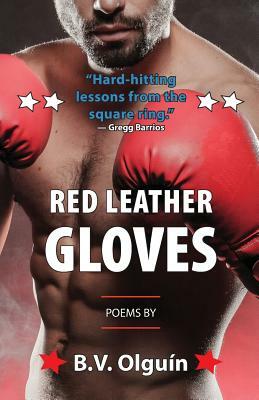 RED LEATHER GLOVES takes us from the mean streets of the Houston's barrios and dockside boxing stables into a dilapidated boxing arena deceptively named the Olympiad where men and boys reenact an ancient rite of passage in desperate pursuit of Olympic fame, title belts, and riches that will elude them all. Olguin writes within the visceral realism of Philip Levine and the boxing authenticity of F. X. Toole: he zeros in on these working class denizens as they train in the art of the not so sweet science of beating bodies into submission. An amateur boxer in his youth, Olguin dissects the sport with the skill of a cut-man, and his poems burst with the pain and physical toll the sport exacts.